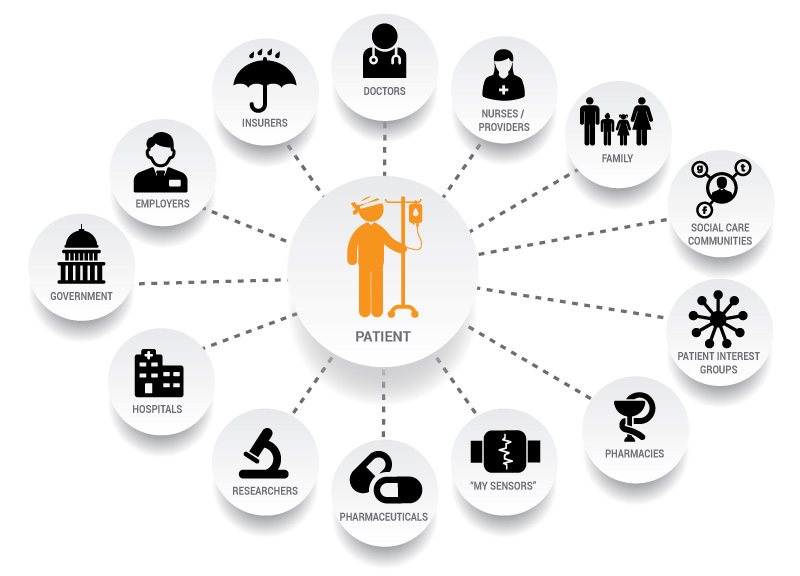 The person [patient] is in the centre of the medical world; still almost every eCare solution is designed to meet the requirements of organizations; i.e. the solutions are the result from a top-down approach; not from the patient perspective. One could even say that patients, in IT terms, are not considered as empowered users, but they are considered as .... 'patients'. We find this quite unacceptable in a a world that changes so rapidly; with an internet that provides an overwhelming amount of information, with social networks that can help and tools that make people aware of their condition. Imagine if the data captured by sensors, worn by patients, is enriched with other [patient] data & [medical] knowledge! It will provide patients with better insights in their 'lifes' from a medical/health perspective. We beleive that this will lead to patients who can help themselves, can help other patients. Within , to improve on their condition(s). People are restrained by the way how regulations are implemented in IT solutions; it goes to far to say that this impact the quality of patients lifes; it's fair to say that these are an unnecessary burden. Burdens must be removed. Patients, and so are we, are under the impression that organizations in the medical domain can, should, improve on overall efficiency. Instead organizations and software vendors, optimize processes and IT solutions, as defined by the boundaries of their own 'context'. This doesn't make sense. We're going to change this - leading by example - delivering a new generation of solutions. Designed and developed with 'a patient' mindset - innovative solutions within the overall context of the "medical domain". Our development process has a high 'delivery' rate - because we use the latest technologies and world's most advanced IT tools. We want to meet goals of "patient self-management" by "lessen" the number of contacts between patients and doctors. Substituting manual interactions with an automated service. This calls for a cognotive services solution to 'untap' knowledge. Using Watson by IBM we aim to provide guidance/advice on medication. We have identified smart ways to deliver this service with direct benefits to patients and doctors and indirect benefit to insurance companies and pharmaceuticals. We have identified opportunities for pharmaceuticals to 'digitize' their Patience Informaton Leaflets (in Dutch 'bijsluiters'). Using the same cognotive services/knowledge described above and our decision support system, we think it's possible to advice certain patient groups that changing behaviour could improve the quality of life. By combining sensor data, personal data and logic in business rules we're able to create actionable decisions from data. Our decision models are powerful and easy to maintain which makes it possible to expand these over time. It simply requires more information to be available to "translate" it into rules. We strongly believe that this approach will be serving other needs, for other patients and organizations. Which is why we address this as "open knowledge". It's similar to the open source concept; however we've removed technical complexity. We believe in empowering patients; patient self-management has been happening for some time and we regard it as necessary to make decision support available to other [patient] communities and organizations. Early 2016 we will add samples. It contains personal information, which identifies a person, an overview of the person's relatives and relationships; as well as activities that have taken place [in the past] and tasks that need to be executed. All as information is considered to be part of the Person's Own Dossier [POD]. By January 2016 we'll provide concrete samples that demonstrate the usages of our POD solution. A person can manually input information or import information. The POD is a Dynamic data store that changes over time; unlike traditional IT systems that require a lot of work (and Money!) when changes are implemented, the POD allows features to be added, changed or shared, in an almost effortless manner. Using the data in the POD, a number of documents, medical reports, can be generated. The solution provides an extremely powerful and easy-to-use mail/merge and document templating functionality - allowing any person with 'text'/ word processing skills to create their own reports/documents. The data store contains an overview of incidents, for epilepsy patients these would be seizures, in case of elderly people it would be when the have fallen.